Back to your igloo, redneck. You first three commenters are totally dumb. What are basing your evaluation on, one freaking interview? You guys have no idea. The true face of the hard-left has been revealed, and it is ugly. Should be, "What are *you* basing your information on"
The saddest part of her short run for the VP slot, was the way she was brutally misrepresented. She would give a wonderfully motivational speech to a crowd that would make Obama's look like a Mad Libs collage by comparison. By the time it made it to the evening news, they would have it patched together into a five second sound bite to present her in the worse light possible. Our main stream media went from being the forth estate, whose job is to keep an eye out, and sound the alarm when our liberty is at risk, to being a 5th column, actively working toward the agenda of a political Juggernaut. The Outright, and self admitted bias was sickening. Gov. 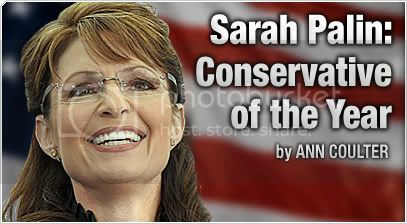 Palin Is a wonderful speaker, and an inspirational leader. It is a shame the American people did not get to see that.